J. Welles Wilder is a giant in the field of technical analysis. In “New Concepts in Technical Trading Systems”, he introduced an array of trading indicators. Now, these indicators are among the most popular. And one of them is the Relative Strength Indicator (RSI). The default RSI setting of 14 periods work well for swing traders. But many intraday traders find it lacking, because it produces infrequent trading signals. Some traders deal with this problem by lowering their time-frame. Others lower the RSI period setting to get a more sensitive oscillator. 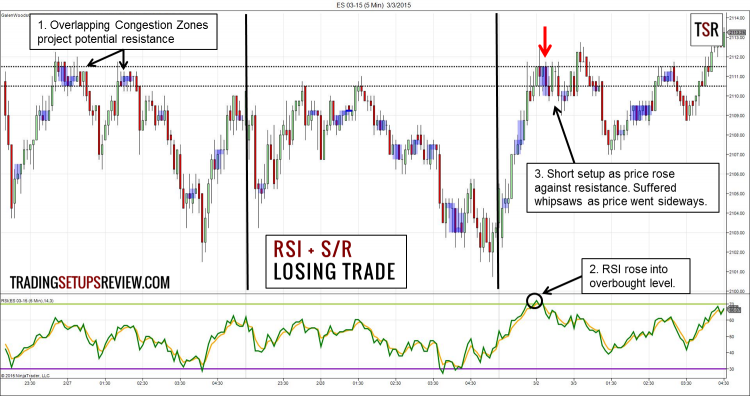 However, these solutions produce RSI signals that are more unreliable. Getting infrequent trades is not always a problem for day trading. That is if the few trading setups that show up are high-quality ones. 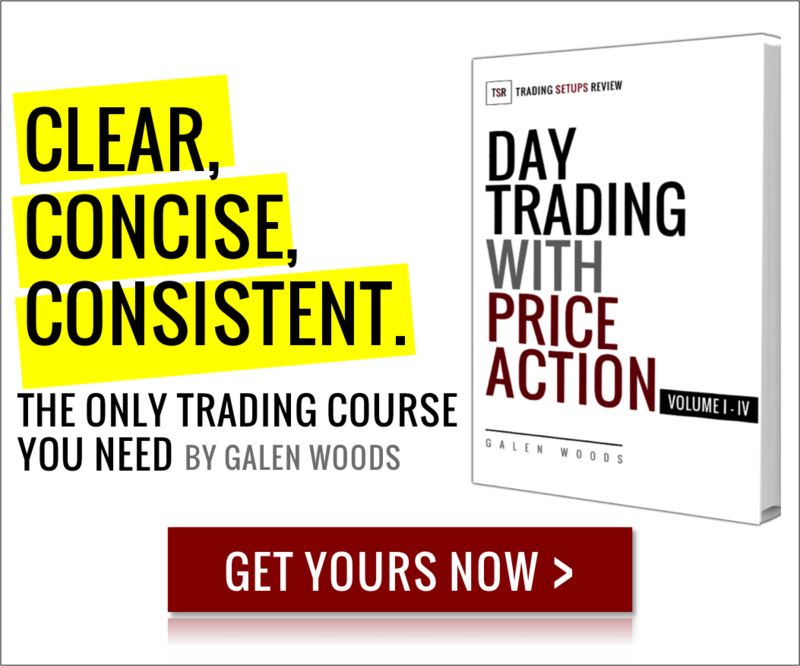 In this article, you will learn a simple method to find quality day trades. The idea is to combine the default 14-period RSI with support/resistance zones. Our aim is to find intraday reversal setups with a high reward-to-risk ratio. Price is testing a support zone. Buy above any bullish price bar. Price is testing a resistance zone. Sell below any bearish price bar. Areas of congestion are useful for finding support and resistance zones. In the examples, I used the Congestion Zone indicator from my price action course. This is a 10-minute chart of the popular day trading market, S&P 500 E-mini (ES). The congestion zone from the previous session projected a potential support zone. The RSI fell below 30, prompting us to look for potential trades. As the RSI became oversold, ES found support and printed a nice bullish inside bar. We went long a tick above it and caught the low of the trading session. The 5-minute time-frame is another common choice among day traders. This congestion area from two sessions ago acted as resistance in the last session. RSI rose above 70 and became overbought. This overbought signal formed as the market rose into the resistance zone. We shorted below the first bearish bar formed in the zone. This trade did not turn out well. After some whipsaws, the market fell by a short distance. Then, it rose and broke the resistance zone for good. In this case, the resistance zone held the market down for a period. However, the timing of this trade was not ideal. As long as the trade risk is under control, take such losses in stride. The key of this trading setup is your assessment of support and resistance zones. Take into account the market structure and focus on the higher quality trading setups. This strategy is suitable for traders who do not want to eyeball the chart. 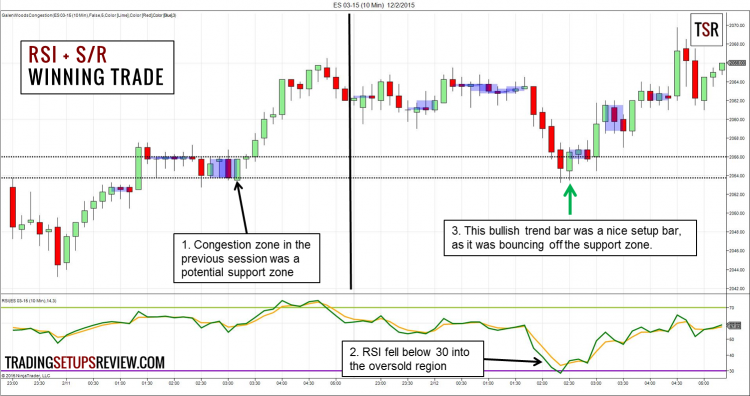 You can mark up support and resistance zones before the start of a trading session. Then, set up alerts for RSI overbought/oversold signals. When your alerts sound off, take a closer look to assess the quality of the trading setups. If you still prefer a more sensitive indicator, try the 2-period RSI. Day trading need not be an affair of rapid trades. By taking fewer trades, you have more time to analyze the larger picture. This is the merit of this RSI day trading strategy. Hi i tried your 20 EMA strategy and it worked perfectly, Thanks guys. i want to ask if i need any indicator to filter this strategy? Price action will be a nice filter. Try looking for setups that have the support of chart patterns. Ive read the length being referred to as both days and periods so I’m trying to determine which one it is. Meaning, if I look at a daily chart the RSI is one number, if I look at it on an intraday day chart the RSI is another number for the same security. Does the length adjust to what ever the chart setting is? In the case of a 1 day 5 min chart would it view each 5 min period as period to make up the length of 14? I cant seem to find decisive clarity on this. Thanks! Basically, a period is the time duration 1 bar (candlestick) on your chart represents. Period is the general term. A period can be a day, an hour, or minutes etc, depending on your chart. In a chart with each bar representing 5 min, 1 period is 5 min. So yes, each 5 min is a period and your RSI period setting should stay at 14. Normally, you can use the same indicator period setting regardless of your time frame. However, some traders find it useful to vary the setting. You can read more about indicators settings here. I like the idea of using the RSI but never really understood it. And also a bonus using the S & R lines. Glad to hear that! For best results, all indicators should be used in conjunction with price action analysis. Hi Uneek, this article provides an excellent explanation of the technical calculation of RSI using 14-period as an example. Take a look!